Last weekend, my grandparents visited, and as I know they have a love for gardens, flowers, and all things beautiful, we took them to Gibb’s Gardens. Daffodils, cherry trees, and a couple other early spring blossoms looked gorgeous, flowering across the landscape. One bloom that was absent, however, was that of the Bradford pear. We passed many planted in the yards of homeowners on our drive to the gardens, however the tree was absent there. This absence is for very good reason, as the Bradford pear has become a hugely invasive species, choking out other native trees and plants in its wake. First, a bit about the Bradford pear. It is originally native to China, and is a sub-species of a group known as the Callery pears, or almost any ornamental pear variety. It can grown between 30-50 feet tall and 20-30 feet wide. It is a rapid grower with a short to moderate lifespan. 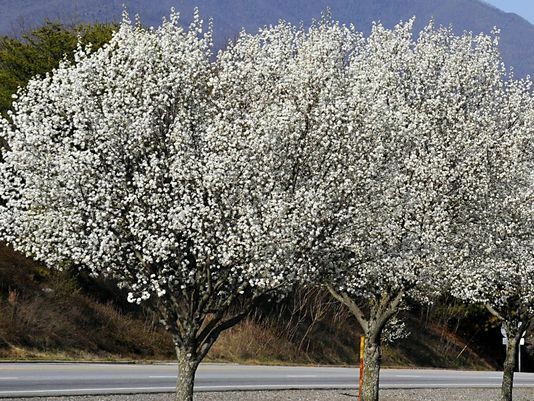 It is largely disease and pest resistant, and produces fruit through cross pollination with other Callery pear varieties. Why are they invasive? Simple. Cross pollination of the Bradford with other Callery varieties produces fruit. Birds then eat the fruit, and in doing so, they disperse the seeds across a wide area. These seeds are quick and easy to germinate and grow wild, and due to the cross pollination, they can develop other fruits and thorns that are not seen on parent varieties, resulting in thorny pear thickets. These offspring, known only as Callery pears, grow rapidly and can choke out other native species. The spread of the Callery pears is rampant and shows no signs of slowing down. If you have any of the Callery varieties planted in your yard, consider cutting them down and replacing them with any other spring-flowering trees, such as: dogwood, redbud, silverbell, cherry, or magnolia. If you suspect that Callery varieties are popping up, be quick to mow them down and treat the mowed stems (we use vinegar & salt, you could also smother them out with a black tarp). Callery pears are very hardy and can grow back from even a simple stump, so full removal is necessary. Consider your native species, and cut down your invasive Bradford pear trees today! Great post. I did not know this and I live learning new things. I love the look of the Bradford pear trees, which has become the maple tree of the south with their beautiful fall colors, however we took both of ours down last year before they started splitting even though they would not cause damage to property. Unfortunately, our neighbors have not done the same with theirs next to their house and our driveway. I am sure that one day part of their trees will be on their roof or our cars. We even offered to pay half but no. Previous Previous post: Fun Weekend! Next Next post: Our First On-Farm Event!